In April 2010, the New York State Board of Regents challenged the library community and the Regents Advisory Council on Libraries to develop and recommend to the Board a new “2020 Vision” for library services in order to ensure the greatest access to information for all New Yorkers. Existing Regents statewide policy for libraries, contained in the document Meeting the Needs of All New Yorkers: Library Service in the New Century, Final Report of the Regents Commission on Library Services was now a decade old. While much had been accomplished, the library, technology and economic landscape had changed drastically from 2000 to 2010. Due in part to the severe economic downturn caused by the Great Recession of 2007, library use was increasing dramatically while State funding for libraries was decreasing. All types of libraries – academic, public, school and special – were facing new and different demands for services and programs from New Yorkers. It was time for a new vision and statewide policy plan. The Regents Advisory Council on Libraries, then under the leadership of Council Chair Bridget Quinn-Carey (2010-2011) welcomed this challenge from the Board of Regents. The Council sponsored an open meeting at the NYLA Conference in November 2010 to gather new ideas and feedback on the perceived need for a new vision for library services. The Council then voted unanimously at their December 2010 meeting to establish a 2020 Vision Planning Taskforce under the leadership of John Hammond. The Planning Taskforce worked with the library and education communities for more than a year to develop a new vision and innovative statewide plan for library services. There were multiple statewide calls for both ideas and feedback from the library and education communities, from the general public and from other stakeholders such as government officials, business leaders and community groups. The Planning Taskforce made extensive use of technology to gather ideas and comments. To ensure inclusiveness, transparency and accountability, the plan development process was publicly communicated via emails to stakeholders, listserv postings, blogs and websites. Comments from stakeholder groups and individuals were made publicly available on the Regents Advisory Council on Libraries website. The 2011 New York Library Association annual conference offered an opportunity for the library community to share their feedback on an initial draft. 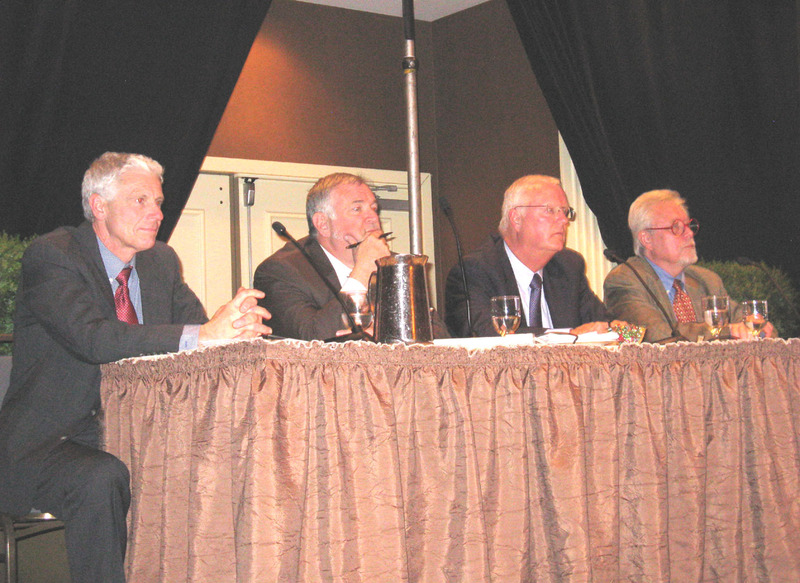 On November 4, an open meeting was held in Saratoga Springs. Regent Roger Tilles, chair of the Regents Committee on Cultural Education, Jeffrey W. Cannell, Deputy Commissioner for Cultural Education, Council chair person Gerald Nichols and Council 2020 Vision Planning Taskforce chair John Hammond listened to comments about the first draft. Over 100 people attended this open meeting, and others provided written comments. These comments, along with those received electronically, assisted the Planning Taskforce in developing a second draft. After receiving statewide input on the second draft of the new vision and plan, the Regents Advisory Council on Libraries voted unanimously in March 2012 to adopt the final version for presentation to the New York State Board of Regents. Creating the Future, a 2020 Vision and Plan for Library Services in New York State: Recommendations of the New York State Regents Advisory Council on Libraries to the New York State Board of Regents includes 60 recommendations that are designed to improve library services for all New Yorkers. On April 24, 2012, this exciting new vision and plan for library services was accepted by the Board of Regents. The Board of Regents also directed Deputy Commissioner Jeffrey Cannell and State Librarian Bernard A. Margolis to work with the Council and others to develop an implementation strategy and detailed action plan. The plan will identify which of the recommendations will be implemented through Regents action, which may require changes to legislation and which may require some other type of action by the State Library, the library community and/or other key stakeholders. March 2012 – Regents Advisory Council on Libraries approves final 2020 vision document and submits to the State Education Department and to the Board of Regents. April 2012 – 2020 Vision document accepted by the Board of Regents. The Board of Regents, on June 3, 1894, voted to establish the Regents Advisory Council on Libraries "to serve as a library council with whom the University officers may consult whenever the advice or cooperation of experts may be desirable." The Regents Advisory Council on Libraries advises the Regents regarding library policy, works with the officers of the State Education Department in developing comprehensive statewide library and information policy and makes recommendations to the Regents concerning the implementation of the program. There are twelve (12) members of the Regents Advisory Council on Libraries. Members are appointed by the Board of Regents upon recommendation of the Commissioner of Education. Membership is for a five (5) year term. If a member is appointed to fill an unexpired term, he or she is eligible for an additional full five (5) year term. Reappointment may be made after a lapse of one (1) year. Terms of members begin October 1. The Regents Advisory Council on Libraries meets a minimum of four times a year, typically in January, April, September and December either through face-to-face meetings or conference calls. The Council meets face-to-face with the Board of Regents at least once a year to discuss library policy issues, typically during the April or May Regents meetings. The 2007 through 2011 annual reports of the Regents Advisory Council on Libraries to the Board of Regents are located on the RAC website. Monitor and Advise. The Regents Advisory Council will monitor and advise on State Education Department and Office of Cultural Education policies, staffing, long-range plans, legislative proposals, regulations affecting libraries, and library implications of other Education Department and Regents Programs. The Regents Advisory Council will also monitor and advise on Federal policy and long-range plans regarding libraries. Strengthen. The Regents Advisory Council will work to strengthen the programs and services of the New York State Research Library, the Division of Library Development, and other programs and services of the State Education Department that affect libraries. Communicate. The Regents Advisory Council will ensure that effective communication takes place with the Regents and the Commissioner of Education regarding library matters. The Regents Advisory Council will also ensure that effective communication takes place between the Regents and the library community. The Regents Advisory Council will seek to build an effective consensus on all policies and programs affecting all types of libraries. The Regents Advisory Council will act as an advocate for libraries, library staff, and library trustees. More information about the Council and its work. Between April 2010 and April 2012, the Regents Advisory Council on Libraries met as a whole twelve times in order to advance development of the “2020 Vision.” The Council also met with the Board of Regents three times between April 2010 and April 2012 to discuss preliminary findings and provide progress updates. As described in more detail in Appendix A, the Council held two open meetings, one in November 2010 and one in November 2011 to gather input and feedback from the library community. The Council created a 2020 Vision Planning Task Force at their December 7, 2010, meeting and appointed John Hammond as Chairperson. The group was charged to work with the library and education communities in developing the new “2020 Vision.” The Planning Taskforce met by conference call fourteen times between January 2011 and March 2012. Taskforce members made extensive use of email and also established a Google group to carry out their work. The Taskforce completed its charge in March 2012. Over the course of the two years, all members of the Regents Advisory Council on Libraries were involved in advancing the new “2020 Vision.” The Council members and State Education Department staff who served on or supported the work of the 2020 Vision Planning Taskforce have an asterisk next to their name. Chief Operating Officer, Queens Library; Louise S. Sherby (2014), Professor, Hunter College Libraries. Previous Members: Barbara Hamlin (2011), Trustee, Wood Library, Canandaigua; Dionne Mack-Harvin (2011), Executive Director, Brooklyn Public Library; Samuel L. Simon (2010), Trustee, Ramapo Catskill Library System. What are the two most important roles of libraries today? What will they be in the future? How will libraries fulfill these future roles? What are the greatest challenges libraries will face over the next 10 years? What assets and resources do libraries have that can overcome these challenges? What are the barriers that will prevent libraries from meeting these challenges? How can library service be extended to those currently not using libraries? How do we engage community members in connecting their needs to libraries? What will be the most important roles of school libraries in the future? What will increase the visibility and relevance of school libraries? How can academic libraries be more integral to their own institution’s community? Is there a role for academic libraries beyond the campus? If so, what is that role? What can public libraries do to ensure their survival? How can they better serve their communities? What will be the most important roles of special and research libraries in the future? What will increase the visibility and relevance of special and research libraries? What are the greatest challenges facing New York State’s library systems over the next 10 years? What are the assets and resources library systems will need to meet these challenges? How can the State Library and the State Education Department help libraries position themselves to successfully meet the needs of all New Yorkers for library services in 2020 and beyond? What will be the impact on libraries with the rapid growth of commercial information sources like streaming video, iTunes, and e-books? How can libraries prosper in a Digital Age? The need to educate non-users about library services, bringing more people to the library. Responses to these questions and other comments have been posted on the Regents Advisory Council on Libraries website. What services should New Yorkers expect from their libraries in the Digital Age? How can libraries better engage community members in connecting their needs to libraries? How can library services be extended to those not currently using libraries? What will be the impact on libraries of the rapid growth of commercial information sources like streaming video, iTunes, and e-books? How often do you visit a library? Some 600 New Yorkers responded to the survey. A significant number of respondents indicated that they use their public libraries (Table A, Chart A), and many stated that they visit their library at least once a week (Table B, Chart B). Table B: How often do you visit a library? The Taskforce reviewed all of the comments and recommendations presented by the library community, education organizations and the general public when developing the first draft of the plan. The first draft was released to the library community in October, 2011. The second draft was widely disseminated for comment in January, 2012 to education and library organizations, individuals who had previously responded, and additional statewide, nonprofit business and media organizations and the general public. In 2011, the New York State Library presented a written status report on the implementation of Meeting the Needs of All New Yorkers: Library Services in the New Century, Final Report of the Regents Commission on Library Services (2000) to the Board of Regents and to the library community. This detailed status report, entitled A Final Review: Implementation of the Recommendations of the Regents Commission on Library Services, 2000 to 2010 , documents progress on each of the ten recommendations for improving library services. It also describes the many ways in which the libraries, library systems and other library and education organizations in New York State worked together and individually to advance statewide goals for improvement of library services, highlights progress made and identifies several remaining challenges. The Regents Advisory Council on Libraries used the contents of A Final Review to help inform development of the new recommendations in Creating the Future, a 2020 Vision and Plan for Library Services in New York State: Recommendations of the New York State Regents Advisory Council on Libraries to the New York State Board of Regents. For more detailed information on implementation activities and highlights of progress on each recommendation, view the full status report . The mission of the New York State Education Department — “To raise the knowledge, skill, and opportunity of all the people in New York” — provides direction for libraries, archives, and museums, as well as the formal educational structure of schools and colleges. The Office of Cultural Education, which includes the New York State Library, operates under the following principles: a focus on the public as primary audience; a focus on statewide impact and value; including an educational component accessible to a variety of learning levels in all activities; stewardship of collections, including research and availability for use; and digital technology as a component of all activities. The New York State Library provides information and library services to New Yorkers through the Division of Library Development and its Research Library. The Division of Library Development works in partnership with the state’s 73 library systems to bring cost-effective, high-quality library services to New Yorkers via the state’s 7,000 school, public, academic, and special libraries. Staff experts work with librarians, trustees, school administrators, public officials, and local leaders to solve problems and find new ways of making library services and resources available to their community. Library Development administers more than $100 million in state and federal funding for New York’s libraries and helps New York’s libraries take full advantage of federal and private funding programs like the Library Services and Technology Act (LSTA), NTIA Broadband Technology Opportunity Program grants, E-rate telecommunications discounts, and Gates Library Foundation grants. The Research Library is the principal library for the people and government of New York State and serves the research needs of individuals, schools and universities, and the business and scientific communities. With over 20 million items and a strong focus on the culture and history of New York State, the Library circulates books to individuals onsite and through interlibrary loan to public, academic, school and special libraries statewide. One of the 125 largest research libraries in North America, the Research Library is the only state library to qualify for membership in the Association of Research Libraries. Visitors to the library access the comprehensive local history and genealogy collection, law library, federal and state document collection, and use free internet and wireless service. All New York residents 18 years and older may apply for a Resident Borrower’s Card. The Library provides all New Yorkers with access from their local library, home, school, or office to the New York Online Virtual Electronic Library (NOVELNY), a rich online resource of information, reference materials, full text magazines and newspaper articles, and scholarly publications. NOVELNY can be accessed with a local library card or a valid New York State driver license/non-driver ID. The Talking Book and Braille Library is a regional library for the National Library Service and is part of the Research Library. TBBL serves some 30,000 disabled adults and children in 55 upstate counties. The New York State Library is situated in the Office of Cultural Education in the New York State Education Department. The Library is located in the Cultural Education Center on Madison Avenue in Albany, New York. The New York State Library works in partnership with the three types of library systems to carry out planning and coordination for the development of library services throughout the state. New York’s 7000 libraries are served by an interlocking network of 73 library systems, consisting of 23 public library systems, 41 school library systems, and nine Reference and Research Library Resources Systems and Councils (also called Councils) (3Rs). These systems were created by the Regents, the Executive and the State Legislature to provide services designed to address the needs of their member libraries and to provide economies of scale in making shared services available to libraries that could otherwise not afford them. Systems also equalize the quality of library services throughout the state. Public Library Systems: Public library systems were created in the late 1950s to serve public libraries. They provide a range of direct support services to public libraries that enable them and their branches to serve their communities better. All but one of the 755 public libraries and 314 branch libraries (1069 outlets) are members of one of the state’s 23 public library systems. The 26 central and co-central libraries of the public library systems provide extended public service hours and reference and information service to residents throughout the service areas of the systems. The New York Comprehensive Center (NYCC)/RMC Research Corporation, in consultation with the New York State Education Department, the New York State Library and the New York Library Association, has produced a new publication entitled, Informational Brief: Impact of School Libraries on Student Achievement . This comprehensive brief provides a current and rigorous research analyses which demonstrates the positive impact that school libraries and school librarians have in advancing student learning. By referencing numerous studies conducted throughout the United States, the brief illustrates the importance of school libraries in the lives of all students, particularly when it comes to literacy, college and career readiness, assessment and graduation rates. The brief is framed around the New York State Board of Regents Reform Agenda. The New York Comprehensive Center (NYCC) is one of 16 regional comprehensive centers funded by the U.S. Department of Education. NYCC works with the New York State Education Department to support education leaders and encourage student achievement.